1. Brahms Motet, “O Heiland, reiss‘ die Himmel auf,” (O Savior, Open the Heavenly Gates,” Op. 74 No. 2 transposed up a step to g dorian for SATB recorders. 2. The last section, “Et vitam venturi,” from the Credo of Beethoven’s Missa Solemnis Op. 123, for SATB recorders. 3. 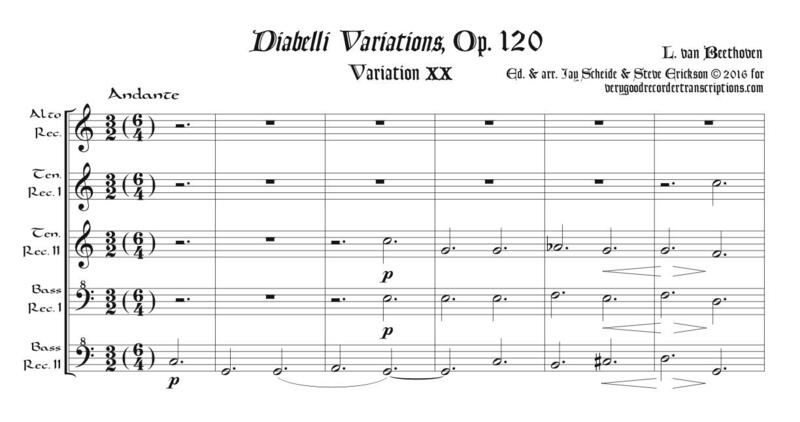 The 1st movement, “Ave Maria,” from Verdi’s Four Sacred Pieces for SATB. 4. An abridged version of the 4th and final movement, “Te Deum”, from Four Sacred Pieces for SATB recorders with Soprano recorder doubling Sopranino and Alto doubling Soprano. 5. The same Brahms Motet, this time at original pitch of f dorian. Five scores and four parts.